The somewhat strange name ‘Hayburn Wyke’ gives us some clues as to the area’s history. Hayburn is an Anglo Saxon word meaning ‘hunting enclosure by a stream’ and Wyke is the Norse word for ‘sea inlet or creek’ – which combine to describe the landscape of Hayburn Wyke as we know it today. The Hayburn Wyke Inn offers you the chance for some high quality food and drink before or at the end of your visit. A walk from here through the wooded valley leads to a private inlet. The dramatic, almost sheer cliffs covered with dense woodland vegetation provide the backdrop to this secret and very special place. The picturesque Hayburn Wyke waterfall is so close that its water falls directly onto the rocky beach. The beach itself is a paradise for children, who will want to spend hours exploring the millions of different coloured pebbles and rocks. Families can also enjoy a high-tech treasure hunt in a search of a ‘geocache’ hidden in the woods by pupils of Hackness Primary School. The location of the geocache can be downloaded for use on smartphones and GPS devices. Visit www.geocaching.com for details. The surrounding woodland offers peaceful walks and a chance to watch wildlife, with roe deer, badgers and foxes all commonly found in the area. Keep your eyes and ears open for breeding birds such as redstart, blackcap, willow warbler, woodpecker and pied flycatcher. 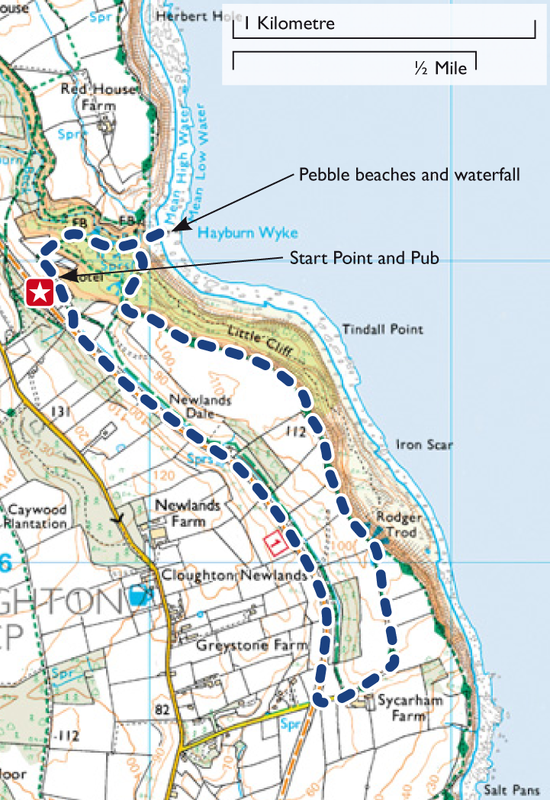 Our suggested walk allows you to head south along the Cleveland Way and return along the Cinder Track, which was the former railway line between Scarborough and Whitby. Kettleness, a lovely and peaceful location to enjoy a picnic looking out over the North Sea.